mobile entertainment by—of all things—unleashing mobile video. customers on qualifying plans—at absolutely no extra cost. Un-carrier movement to the next level. video services stream without fear of overages. 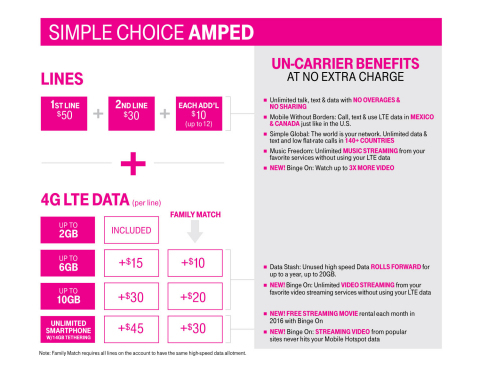 requirements, which are available online at www.t-mobile.com/bingeon. And it’s completely free for video streaming providers to join. services—and everyone wins,” said Legere. account. Binge On is all about customer choice. single month in 2016 with Binge On. video usage is poised to surge more than 400% by 2020.
video has translated directly into an unprecedented surge in overages. estimated $45 billion annually overbuying wireless data they don’t use. high-speed 4G LTE data when everyone gets extra data. 4GB before—a savings of 25% per GB of high-speed data vs. before. participating services won’t eat into that tethered data. compared to Verizon for similar services. unlimited video streaming from popular sites as well. starting Thursday, November 19. For more information on Binge On, see www.t-mobile.com/bingeon. or for Simple Choice for business, see: www.t-mobile.com/BusinessSimpleChoicePlan. way Americans embrace television,” said Roger Lynch, CEO of Sling TV. their wireless devices without running up their monthly data usage. network. Third party content and subscription charges may apply.